The PM says safety and privacy go hand in hand. Prime Minister Malcolm Turnbull with the AFP Tactical Response Team. CANBERRA -- Dismissing privacy and hacking concerns, Prime Minister Malcolm Turnbull has described his request to get access to every single driver's licence picture in the nation as the "logical next step" in the fight against home grown terrorists. Turnbull will on Thursday push the Premiers and Chief Ministers at a special terrorism-focused Council of Australian Governments (COAG) meeting in Canberra to set up a national facial recognition database and bring in nationally uniform periods of detention for suspects of up to 14 days. Access to the millions of licence pictures, added with other biometric data like passport photographs, will assist authorities track down terror suspects in crowds, in real time, through the use of surveillance cameras armed with facial recognition technology. 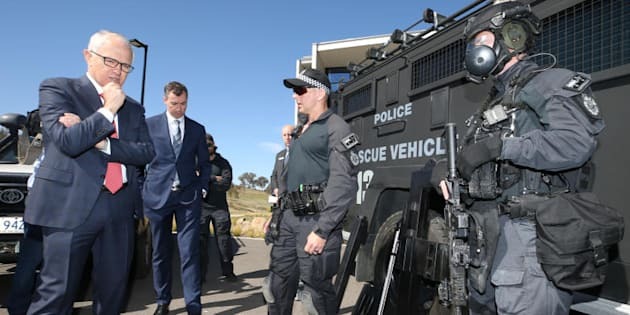 "Imagine the power of being able to identify, to be looking out for and identify a person suspected of being involved in terrorist activities walking into an airport, walking into a sporting stadium," Turnbull told reporters in Canberra. "This is a fundamentally vital piece of technology that takes it up to an additional level of protection as we are committed, as I've said, to keep Australians safe, and we will use every technology and every technique that is available to do that." "So, having a national database so that can all be integrated and accessed in real time is, I think, a logical next step." The Prime Minister on Wednesday sidestepped journalists' questions about privacy concerns in sharing of data to fight terrorism, saying an enormous about of information is already being shared. "I don't know if you've checked your Facebook page lately, but people put an enormous amount of their own data up in the public domain already," Turnbull challenged. "I mean, there has never been more data on citizens than there is today, and the vast bulk of it is actually in the private sector, and you think of the amount of personal data, photographs and so forth that are held on Facebook accounts, I think around three-quarters of Australians have Facebook accounts, so there is a lot of data out there." In dismissing privacy concerns, Turnbull also earlier told the ABC's AM program, "The alternative is to not use data at all." Turnbull insisted the request to the state and territory leaders is about easing access to data which is already available. "Let me tell you, if police need to access that photo on your driver's licence, they can do so now, so we're aware that have," he said. "What we're talking about is taking a drivers' licences and other photo IDs that are in the government domain, and .. being able to access them swiftly and using automation to do so, rather than being a clunky manual system." Asked if "safety trumps privacy in these matters", Turnbull responded, "No, safety and privacy go hand in hand." The COAG meeting on terrorism has been long planned but comes in the shadow of the latest deadly and terrifying mass shooting in the United States. Law enforcement agencies are backing a national facial recognition database with the understanding the access has to be for a "lawful purpose". "This is about bringing automation to something that we already do and it is automation that we need to keep up with the contemporary environment that we've seen," AFP Commissioner Andrew Colvin said. "This is about how can we get identity verification as quickly as we possible can. The technology is available, we already have the information available, it's about bringing the technology and the information together."